Two wins out of two to start the Cambridgeshire Women’s Premiership season for Cambridge City Ladies Development followed up last weekends opening day win over Histon Ladies Reserves with another away victory over another of the newly promoted sides, Fulbourn Institute Bluebirds. 6-0 in their 1st game it was a much closer affair this time around. A good start for Cambridge City Emily Reed firing the visitors into the lead after 2 minutes. Lucy Hurst striking from 25 yards to make it 2-0 in the 11th minute. Were 3-0 to the good just 2 minutes later with Megan Tonks getting the goal. Katie Luddy pulling it back to 3-1 for Fulbourn midway through the 2nd half. Cambridge City scoring again late in the first half to have a 4-1 advantage Tonks getting her 2nd of the game. Fulbourn far from out of it threatened a comeback 2nd half Marie Stubbings and Kirsty Geal pulling it back to 4-3. Cambridge City held out to claim the 3 points. Two games two 4-3 losses for Fulbourn. Also beginning the Premiership season with two wins out of two are ICA Sports Ladies. 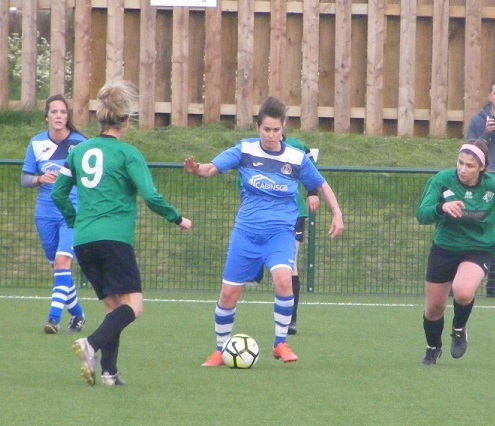 2-0 at Riverside Ladies on the opening day were at home this Sunday taking on March Town United Ladies playing their 1st competitive match of the season. Several new players lining up for March United. Elle Nutter scoring their 1st goal of the season, it was ICA Sports who had their noses in front at the break with Donna Nicholls scoring twice. Nicholls completing her hat-trick in the 2nd half t seal a 3-1 victory. A heavy defeat for Histon Ladies Reserves on the opening day of the season were at home again this Sunday taking on Netherton United Ladies who started the season with a 4-3 win over Fulbourn. Just a single goal settling this game and it went the way of the hosts as Histon Ladies Reserves got their 1st 3 points on the board. One game played in the Cambridgeshire Women’s Championship North on Sunday the Wisbech derby with Wisbech St Mary hosting Wisbech Town. Both sides recording big wins on the opening day of the season. It was once again a high scoring game ending up with an emphatic win for the visitors, Wisbech Town netting 7 times against their rivals, new signings Amy Newell and Aisling Ryan netting on their debuts. There were goals too for Sophie Swindon, Chloe Stanborough, Emma Woods, Kaylie Swindon and captain Faye Kowalewsky. The final score 7-1 Megan Radcliffe with the consolation goal for Wisbech St Mary. A good start to the season in the Championship South for new side Haverhill Rovers Ladies, winning 5-2 on the opening day away to St Ives Town Ladies Development recorded a 2nd successive win at home for the 1st time this season taking on Burwell Tigers Ladies. Joeli Kirby scoring a hat-trick for Haverhill Rovers with Abbi Griffin and Emma Barnes both scoring their 1st goals for the club in a 5-0 win. St Ives Town Ladies Development bounced back from an opening day loss to win their 1st game of the season away to Isleham United Ladies on Sunday. The hosts starting with a 6-1 win themselves over Park Ladies scored twice in the game, a brace from Lauren Gibson along with a goal each for Fran Worrall, Connie Liddiard and Jade Carpenter securing a 5-2 win for St Ives. This entry was posted in Cambridgeshire Women's Championship North, Cambridgeshire Women's Championship South, Cambridgeshire Women's Premiership, The Round-Up and tagged Cambridgeshire Women's Championship North, Cambridgeshire Women's Championship South, Cambridgeshire Women's Premiership, The Round-Up on September 19, 2018 by WFEast.